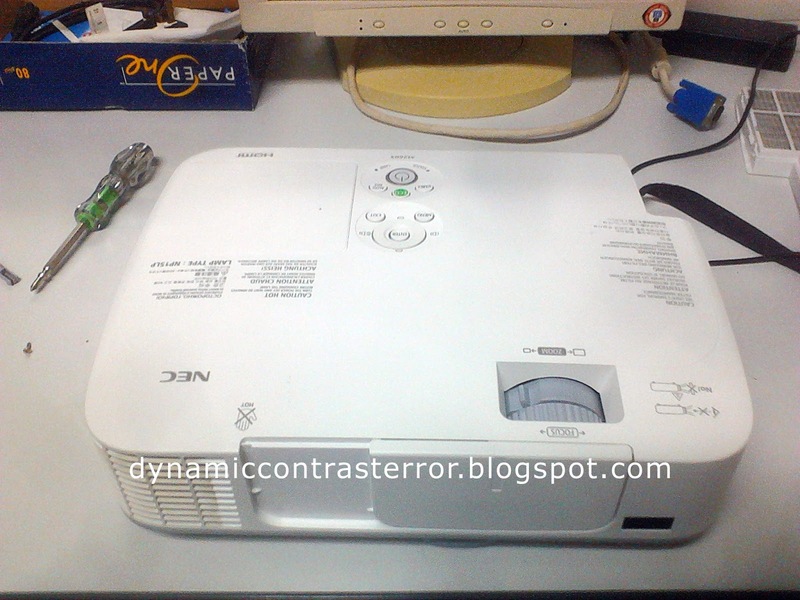 The projector here is an M260X NEC, manufactured in 2011. This was purchased in 20013, and has failed. On switching on, it beeps, the lamp would come on for 1 or 2 seconds, status light flashes once green, followed by 9 cycle red blinking status LED. Looking up the manuals, this is known as a 'dynamic contrast' error. There will also be a clicking noise as the motor tries to find a grip or position of the shutter/iris. Upon failing it will blink red, 9 times each cycle. Dynamic contrast is used by the projector to darken the scene, to get richer blacks, it's active in a few modes, and can be turned off under, MENU, PICTURE, DETAILED SETTINGS. This projector is out of warranty and has about to my calculation 2000~hrs on the lamp. (When I got it working it was actually only 1600hrs) I figured it was not worth sending in for repair. I was quoted $40 for the Iris assembly, and $120 for the workmanship, quoted to me by the NEC service center in Singapore. You will need a small Philips head (+) screw driver for most of the work. 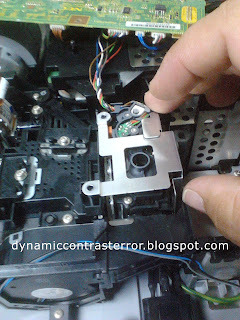 Make sure you get all the screws, I also removed all the feet of the projector. One of the housing screw hides in the air filter area. TIP: Unscrew the lamp cover as well. It has a micro switch, therefore, you may get an error if the cover isn't place via sliding it back in. If the top cover is just closed, the micro switch won't activate, giving a ONE BLINK error. So the last step is to slide back the lamp housing cover. Gently pry open the casing, I find that it gives way easily from the filter side of things. Do not force it open with much speed. 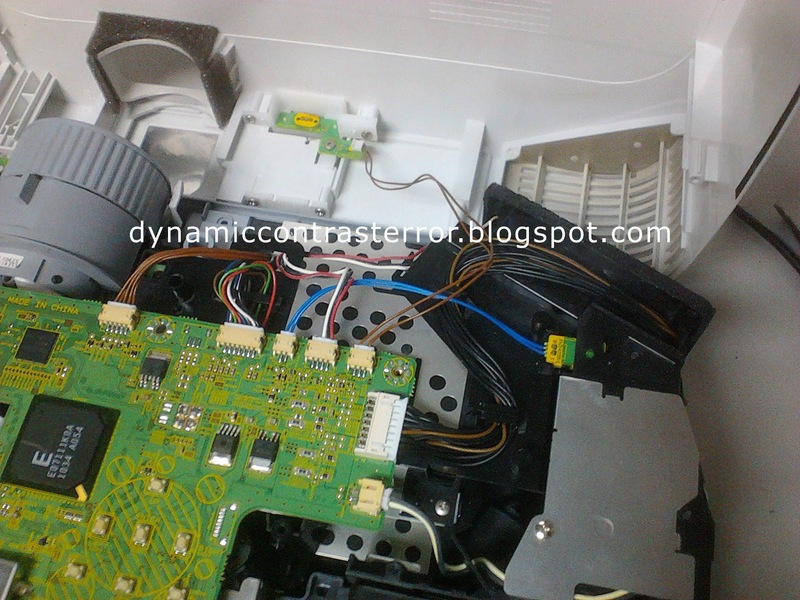 The top cover is attached to the main board via the wire that leads to the lens cover sensor! 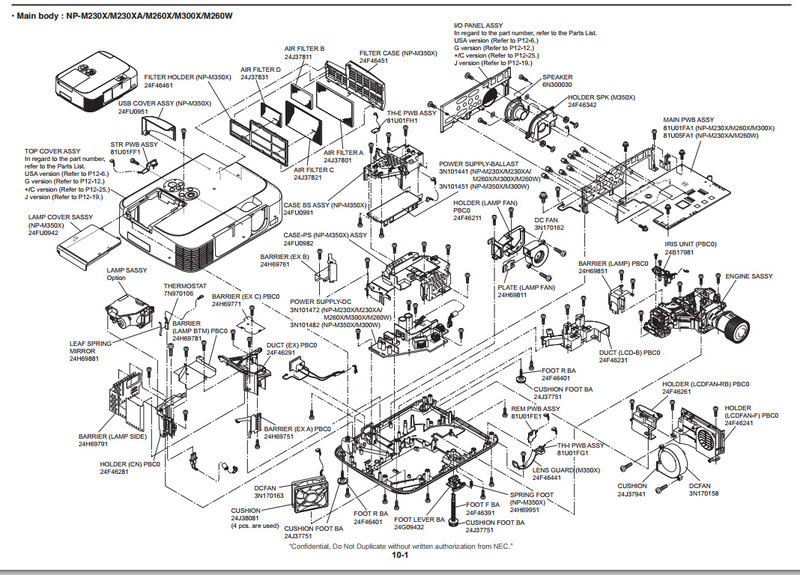 I had to dig around some diagrams to see where to access the assembly. The main Fixya did not have any description. Once the cables are undone, there are two screws at the sides of the IO panel / rear connector / input panel, that needs to be unscrew. (picture only shows one) Undo BOTH the left and right side. The entire board and rear IO panel should then flip forward. Have something for the main board to sit on, I just used the top cover to rest the main board so as not to strain any wires. Next step: Remove the LAMP assembly. WARNING: Be careful not to touch any part of the bulb! like any halogen/pressure lamp source oils from your fingers can cause uneven expansion of the very very very hot lamp and blow it up. $371 in my country. You should see this once the main board is gone, and lamp is gone. 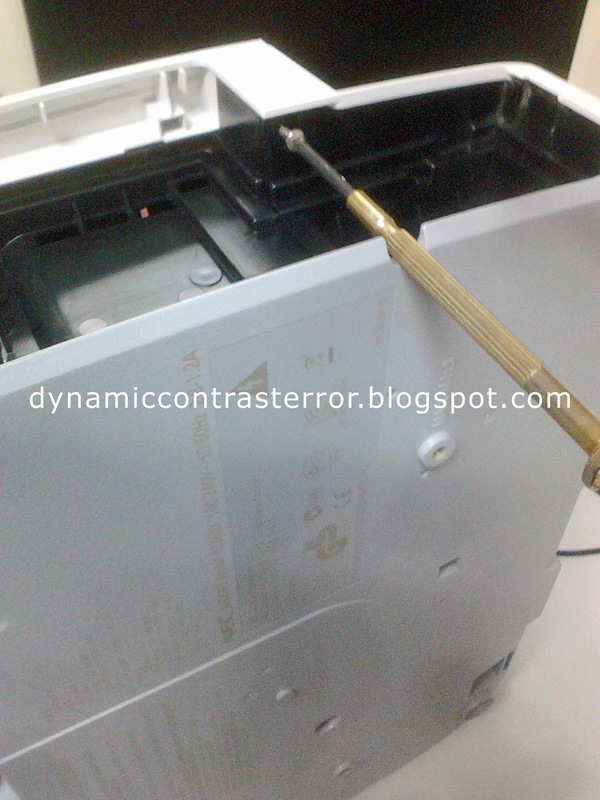 It's a metal shield - BARRIER (LAMP) PBC0 24H69851; remove the two screws and remove it. This is located right next to where the lamp used to be housed. Here is the offending clicker on start up. I just move the blades back and forth a few times. And blew on the REFLECTIVE OPTICAL SENSOR, which in the fixya the guy describes as an octo-coupler. That's all I did an mine was back up working (so far). Things you can try, maybe lightly grease the gears, NOT GUNK IT. 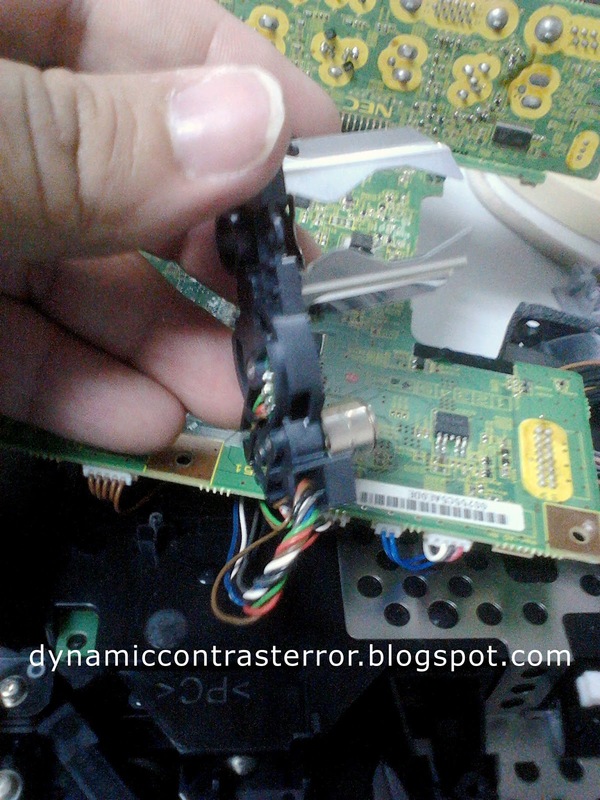 Now once done and angry about a $40 part failing an $800 machine. 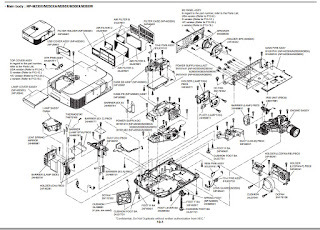 Assemble everything back reverse order. NOTE: unless you defeat the micro switches, you need to replace all the covers for it to fire up. Don't forget this little connector. It dropped in side and I forgot about it. Without this it gives me FOUR cycle red LED flashes. CPU/FAN/PSU error. Hi there. I'm not sure where you are from. In Singapore, the service center didn't say that you could buy from them directly. They did mention the shutter assembly is $40 singapore dollars, but I'm not sure if they will sell it to you. I have yet to come across the component list, so I wouldn't know which part is failing. 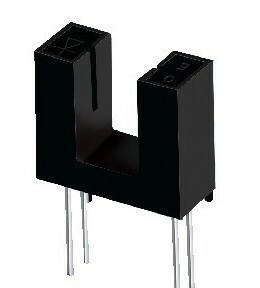 The REFLECTIVE OPTICAL SENSOR should be quite simple to get from like a radioshack or something, there should be some numbers on the component to match it. 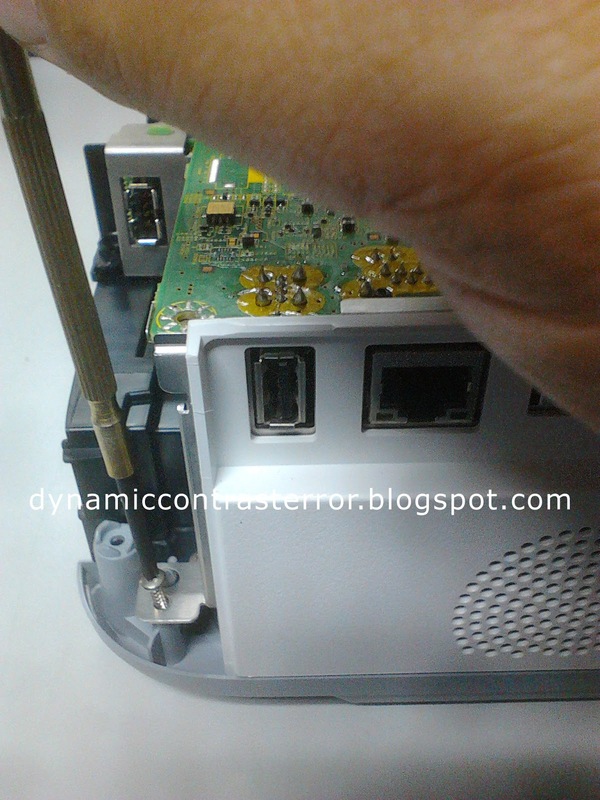 Same error code on a m350x your tutorial/fixing solution work perfect. Hi, really appreciate this. I am about to attempt the same thing. Question I am a little confused the "blades back and forth a few times" is this the blades in the irs unit (shown on photos)? Am I trying to loosen them or something? Also you didn't replace any parts just blew on the sensor, right? Thanks that you found this useful. I basically open and closed the sliver/metallic blades a few times just to make sure they were not stuck in any way. It's like opening and closing a shutter. I didn't replace any parts. but blew on the sensor with some air or a squeeze blower just to get some dust out. Cleaning it with high quality isopropyl alcohol will help too I guess. Thanks, have it open now. Found the blades and have them moving but cant for the life of me see the REFLECTIVE OPTICAL SENSOR, where is that little beast hiding? It should be on the tiny PCB of the iris unit. The same assembly as the metal blades. You have to fully open or fully close to see the sensor. It's tiny and a little tab moves in sync with the blades to activate the sensor. After many tries in the end I had to lubricate the irs blades. So as a note to anyone else they might move ok but they need to move quite freely. Again I am very grateful you took the time to make this blog! The optical sensor is tiny. It's found next to the motor on the IRIS assembly under the half cog/gear that moves the blades. I agree with a previous comment that the blades should move freely. This one had quite a bit of resistance and moving them manually wasn't enough. I used silicon spray (but dabbed it on so as not to get anything on the sensor) on all the pivot points and gears. The problem is that the motor sticks, if you unscrew the motor on the Iris unit a little, the motor should be able to move freely. You should be able to move the two metal parts back and through freely without any resistance. You could also try adding grease or oil to the gears, this could help a little too. I found that the Iris unit is also not needed, the projector will function without it, but the sensor on the Iris unit does need to detect movement when the projector starts up. Hope this helps anyone reading - thanks, Jack. hey, i just wanted to say thank you for this.. Thanks! Fixed the iris problem. I have a purple tint on the screen now. Anyone know how to fix it? 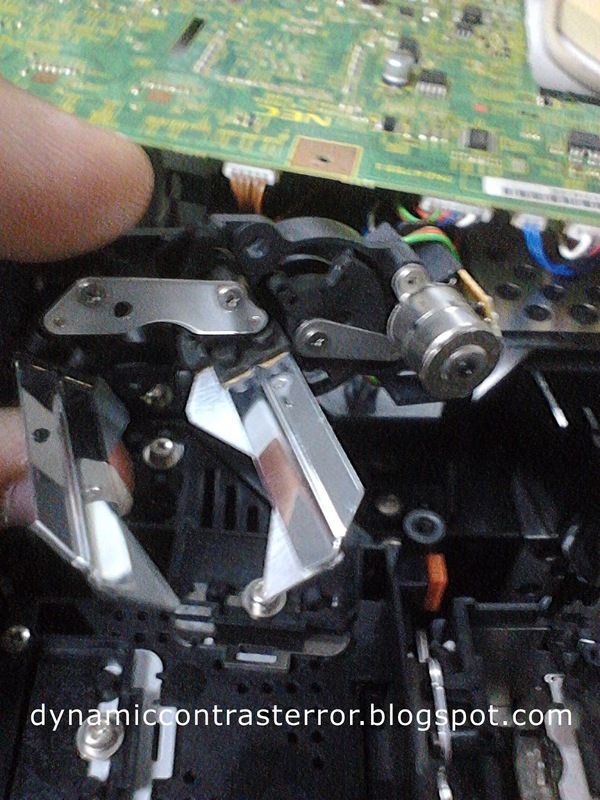 i cant seem to get the ribbon connectors off any hints? LIFT THE BLACK TABS AND BE CAREFUL NOT TO RIP THEM, I RIPPED MY BLUE ONES RIBBON ON MY £2000 P451W, FUMING! THESE HAVE A BAD BAD BAD DESIGN FAULT WHERE DUST GETS TRAPPED IN THE LENS AND IS IMPOSSIBLE TO GET OUT. 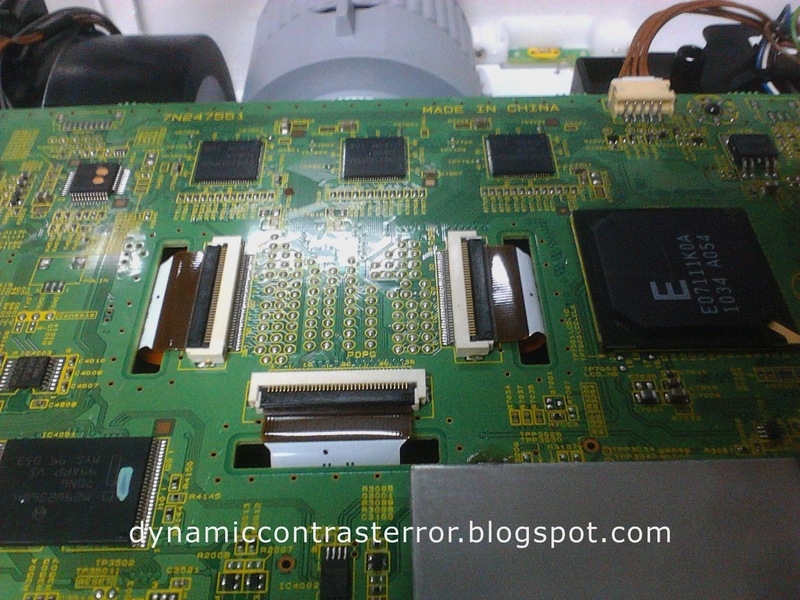 How did you manage to get the 3 ribbon cables off of the main board? did as you said, fairly simple. I pulled the IRIS out and moved the blades around, put it back together and same thing happened. Saw that someone above used WD40 so I took it apart and tried again. Now when I plug it in, it turns orange and when I click the button, nothing happens. double checked all wires, retraced my steps, but the machine won't even turn now. Anyone have advice on this? Thank you so much for this guide. You saved my projector! Works also for NEC NP P350W. Thank you! Worked through this and my projector is up and running again. Many many thanks, this totally worked for my 350x. The gears felt sort of sticky still after moving them so I used a tiny drop of com oil I had for my RC. I’m talking the smallest amount , projector fired right up. Thanks again! Thanks. 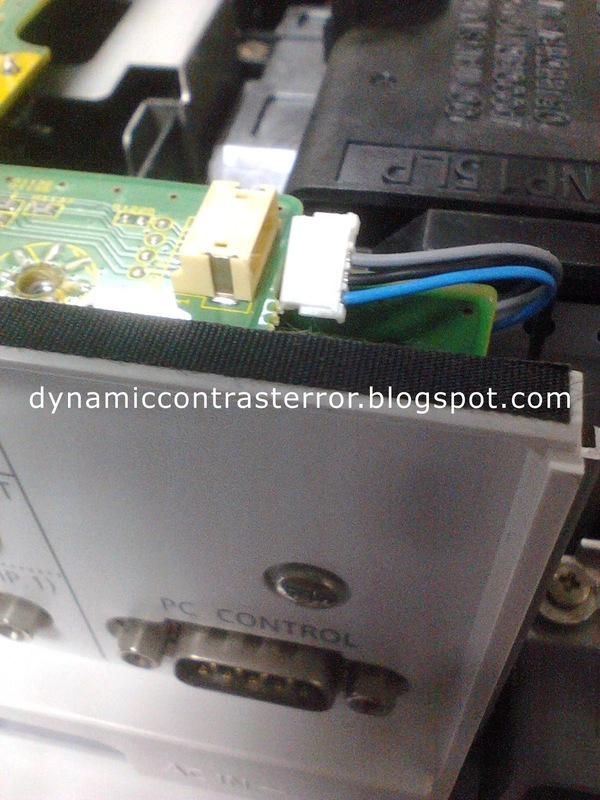 Was good enough to follow to fix an iris calibration error on a NEC P420XG. Thanks for the projector tips. Also check http://projectoreviews.com/epson-home-cinema-2150-wireless-1080p-miracast-3lcd-projector/ as well.